The natural question will arise what is to be the use of this Tower. Without entering into the scientific value to which this Tower may lead, and the many scientific uses it may hereafter be put to, we take it that first and foremost it will be one of, if not, the greatest feature of the Universal Exhibition opening on the 5th of May next. Secondly, it is undoubtedly a commercial enterprise, and we are bound to confess we see no reason why so much mud should have been thrown at M. Eiffel by part of the press, even if it turns out to have no further value. 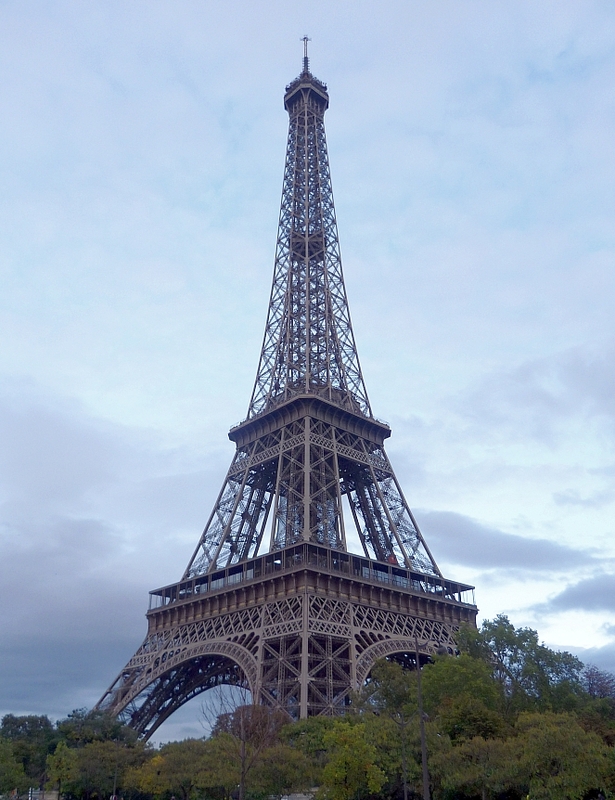 Assuredly, M. Eiffel, and those with him, have as much right to invest their money in the success of the Eiffel Tower as in any other commercial undertaking. The photograph above shows the base structure of the tower. 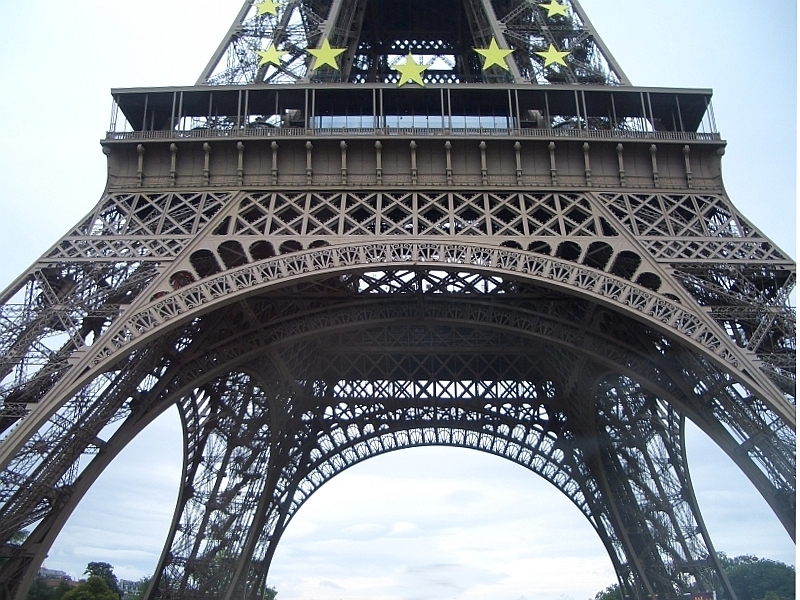 It was taken on one of those occasions when the tower is decorated to mark a specific event, in this case France's presidency of the European Union in 2008. 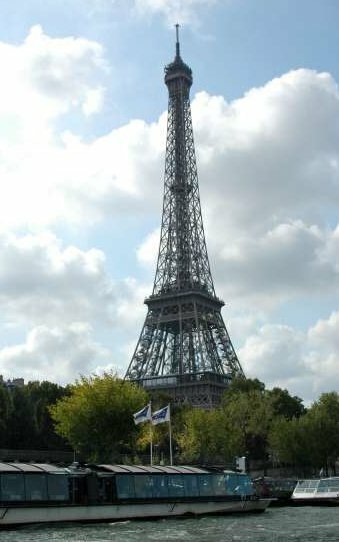 There is no doubt now that the tower was an incredibly bold and ingenious piece of engineering work for its time: Baedeker's Paris guide points out that "[i]ts method of construction distributes the total weight of 7500 tonnes in such a way that the pressure it exerts on the ground is only 4 kg per sq. cm (60 lb per sq. in), the equivalent of an average-sized adult on the seat of a chair" (113). It may not have had the practical uses that some contemporaries envisaged — for meteorological and astronomical studies, or "optical telegraphy" ("Fritz" 36); but it still serves as the most instantly recognisable symbol of Paris today. It has also spawned some offspring, such as the Sapporo and Tokyo Towers in Japan, and other freestanding iron structures like the Canton Tower in China and (most recently) Anish Kapoor's ArcelorMittal Orbit for the London Olympics of 2012. "Fritrz" rightly foresaw that "the craving for something new, startling and sensational" would only increase with the years. "Fritz," ed. . London: F. C. Hagan &: Co., 1889. Internet Archive. Web. 14 October 2012. Kottman, Manfred. Baedeker's Paris. English Language ed. Norwich: Jarrold & Sons, 1987.